Finding the perfect engagement ring is an important task. 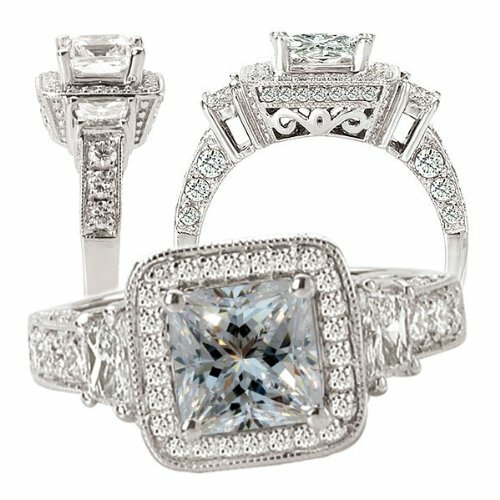 With so many designs and styles to choose from, it may seem like a challenge to find the right ring for your beloved. 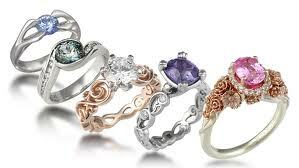 The cut of stones vary as much as the people who will wear the rings. A popular choice for many couples is oval engagement rings. The stones are stunning and may have a round appearance or appear to be more elongated depending on the dimensions. The wide selection of designs ensures you will find the ideal ring with an oval cut stone for your love. You can find oval stones at all fine jewelers including online sites such as Brilliant Earth and Ritani. The beautiful center oval stone is accented on each side by a cluster of three small diamonds in this rose gold trio diamond ring. A four-prong basket setting holds the center stone on the polished band. Intricate and decorative scrolling detail adorns the warm 14k rose gold band. This ornate ring is available at Brilliant Earth. 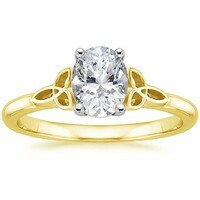 This brilliant 18k yellow gold engagement ring features a stunning oval center stone in a four-prong setting. Framing the stone are graceful Celtic love knots formed in slender curves and loops with the metal. The knot is a symbol of two souls that are bound by everlasting love. You can find the ring at Brilliant Earth. 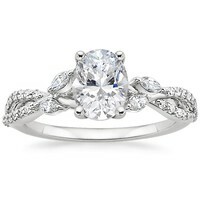 The classic lines of this graceful design features a four prong setting that holds the solitaire oval center stone. Platinum prongs provide maximum strength to secure the stone. The raised cathedral tulip-inspired setting has open worked detail. You can find this ring with its simplistic beauty in 18k white gold at the Ritani web site. Delicate floral buds and wispy vines adorn the Budding Willow ring. The band is made of 18k white gold and has a polished finish. The oval center stone is framed by the gracefully entwined buds. 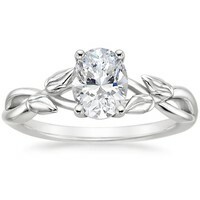 The ring features a trellis setting and rhodium finish. Brilliant Earth carries this delicate and feminine ring. A stunning halo surrounds the brilliant oval center stone on this 18k white gold ring. Small round diamonds make up the halo and match the dazzling diamond accents that grace each side of the polished band. The antique design of the ring adds charm to the unique style of the ring. This fancy ring is available at the Brilliant Earth web site. This Double French Set ring features accent diamonds in an open V design framing the center oval stone. Accent diamonds are set into the sides of the setting for a decorative touch. A French setting means the diamonds are set close together and have exposed sides for maximum sparkle. This elegant 18k yellow gold ring is available at Ritani. Small round accent diamonds adorn the sides of this 18k white gold band in exquisite detail. The diamonds are French-set to allow more light in the open sides for extra sparkle from the stone. The oval center stone is displayed brilliantly between the accent stones. The band has classic lines and a polished finish. This oval engagement ring with its simplistic beauty is available at Ritani. The Modern Bypass Micropave Diamond band engagement ring is made of palladium. 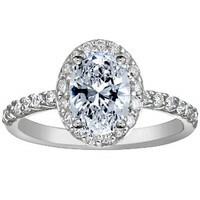 With a modern look the rows of diamonds twist round the center oval stone. Micropave provides a paved effect with a surface of smaller diamonds that are set with small points of metal and no prongs. This unique ring is available at the Ritani web site. This breathtaking Luxe Willow diamond ring features delicate vines that have small round diamonds. There are four marquise diamond buds adorning each side of the oval center stone. With a trellis setting and rhodium finish, this unique ring is made of 18k white gold. You can find this stunning ring at the Brilliant Earth web site. 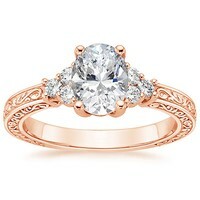 The traditional solitaire diamond is available as an oval engagement ring. 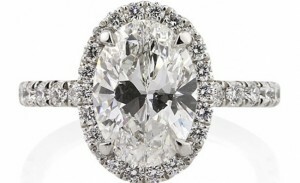 This 18k white gold ring features a glittering oval diamond in a platinum prong setting. The knife-edge design is smooth and reflective. The setting has an X constructed into the design and along with the O shape of the ring represents a hug and kiss. 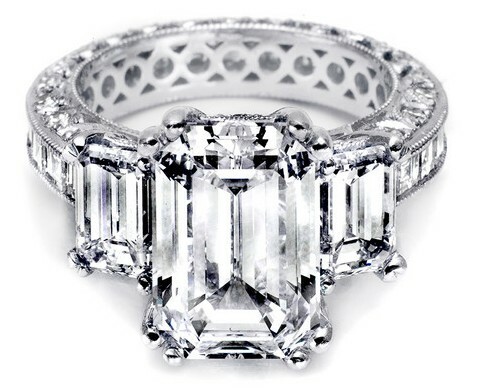 The classic style ring is available at the Ritani web site.